Ford original spare parts catalogue contains dealer information on Ford European assembly. It contains information on cars and light commercial vehicles. With the full installation (program + data) takes about 4.1 GB. Rolling back the date is not required (there is no rollback until October 2010). Revamped distribution, simply run setup.exe and select the installation path. With the full installation (program data) takes about 4,2 GB. Rolling back the date is not required (working without a rollback to January 2011). Completely redesigned distribution, simply run setup.exe and specify the installation path. 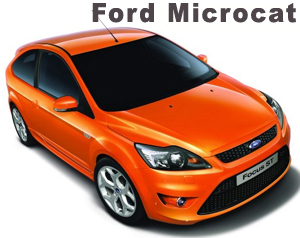 Whereas previously there were previous versions MICROCAT Ford, do not forget to remove them before installing, otherwise there may be problems with the definition of the actual database directory (when you run the program enumerates all logical drives (except for Z:) and looking for a folder FEU_DATA, as well as zero-length file in mc1234 root directory). This network was established to work - just put FEU_Data mc1234 and the windows share folder and assign the network drive letter. When installed on a client places uncheck "Data".